2nd phase ITI Seats are Allotted, Download Provisional Allotment Letter, Schedule of ITI Admissions: Telangana ITI Courses Online admissions schedule 2017, Telangana ITI Online admissions schedule 2017/ ITI Telangana Online admissions schedule, web options dates for ITI Admissions, Certificates verification dates for ITI admissions/ Merit List generation for ITI admissions, Seats Allotment of ITI Online admissions. 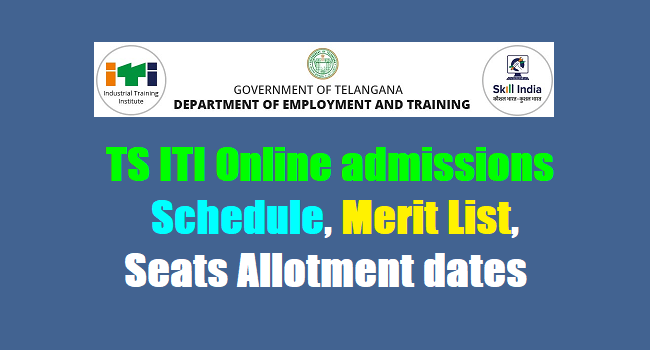 Online Admissions into I.T.I.s: Government have permitted the Director, Employment and Training, Telangana, Hyderabad to make admissions into Government and Private Industrial Training Institutes through online. Accordingly, a notification is issued for admissions into 54 Government I.T.I.s and 222 Private I.T.I.s in Telangana State under NCVT pattern. However, a separate Notification will be issued for the admissions into the remaining 10 Government I.T.I.s under SCVT Pattern later. Web note: Principal Radhakrishna, Principal of the College, said that the candidates registered in the Government and private ITIs will be able to verify their original certificates in the State Girls ITI in Khammam with their original certificates online for 2017-18. From June 29 to July 2, the certification examination will be held. Telangana ITI merit list 2017 released at iti.telangana.gov.in: The Department of Employment and Training, Telangana, has released the 2017 merit list for the Industrial Training Institute (ITI) National Council for Vocational Training (NCVT) and State Council for Vocational Training (SCVT). Candidates who have applied for courses at various ITI in the state can check their merit list from the official website. The exam cannot be attempted more than five times and those who have been admitted in trades affiliated to NCVT will be issued National Trade Certificates in their concerned trade after passing the All India Trade Test (AITT). Those who clear the merit list will gain admission to 54 government ITIs and 222 private ITIs. Step 1: Go to the official website for Telangana ITI (iti.telangana.gov.in). Step 2: Click on “Student Login”. Step 3: Login with your registered ID. Step 4: Enter the required details in the fields provided to search for your merit list. Step 5: Download the result and keep a copy for further reference. "Merit List Released for Merit Card and Click on Student Login"
Seats Allotment order: "ITI Seats are Allotted. Candidates should Login to Print Provisional Allotment Letter........and report to the allotted college from 25 to 29-07-2017 with your original certificates "